Now that Roald Dahl’s 1982 novel The BFG has finally been transformed into a big screen feature film courtesy of Disney and director Steven Spielberg, one aspect of the book that has delighted children and adults alike will be made more obvious: the Big Friendly Giant’s tendency to gobblefunk, the BFG’s own term for the malapropisms, spoonerisms and nonsense words that litter his speech. The BFG’s gobblefunking belongs to a tradition of language play and nonsense writing best known from the works of Edward Lear and Lewis Carroll. Lear’s poetry, limericks and prose writing bubble over with nonsense words: perhaps best-known is the runcible spoon with which the Owl and the Pussycat dined on their mince and slices of quince. Carroll’s books, poems, diaries, and letters to children are littered with enigmas, charades, acrostics, palindromes, conundrums, cyphers and riddles, testifying to his love of word play. 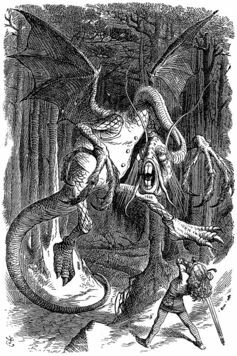 His coining of nonsense words is densest in the poem, Jabberwocky, encountered by Alice when she passes through the looking-glass. Some of the strangest of these are decrypted for Alice by Humpty Dumpty, although his explanations – brillig means four o’clock in the afternoon when you begin broiling things for dinner – are not always convincing. Readers of The BFG must fall back on their own ingenuity to explain his neologisms, many of which draw upon genuine techniques of word formation, which offer real insights into how words are formed and their meanings decoded. The BFG’s language includes words coined for their sounds, drawing upon both onomatopoeia – where the word imitates the sound it describes – and phonaesthesia – where clusters of sounds become associated with specific meanings. Phonaesthemes in English include sl-: slug, slurry, slimy, all of which carry a sense of greasiness and unpleasantness. To these the BFG adds slopgroggled, to describe a sticky situation. Words like ucky-mucky and thingalingaling play on the reduplication of vowel sounds, while others tap into the connotations of certain syllables. Although we may never have encountered words like, for example, grobswitchy, rotsome, bogrotting, muckfrumping andgrizzling, we can be sure that they signal something unpleasant. In contrast, we are sure to enjoy anything that can be described as phizz-whizzing, squiffling or wondercrump. Other words, like whoopsey-splunkers, fizzwiggler and fluckgungled play on the way children enjoy rolling unusual and amusing sounds around their mouths. Other words the BFG coins are from errors. For example, in spoonerisms snapperwhipper,dory-hunky and catasterous disastrophe, the initial syllables have been swapped. Others, likebiffsquiggled, are compounds of genuine English words that can be understood by analysing the component parts. Other words still are formed by blending two standard English words, such as “delicious” and “scrumptious” to form delumptious. One example, the BFG’sscrumdiddlyumptious, is a word that, despite its unwieldy length, has passed into general usage. These processes of associating sounds and senses, and disassembling and recombining word elements to recover their meanings, are valuable ways of promoting a child’s understanding of word structure – what linguists call morphology. Studies of child psychology and education have shown the importance of play in putting a child’s developing linguistic skills into practice. Children have a natural propensity to play with language from an early age, as seen in the nonsense rhymes that accompany playground games, an enjoyment of riddles, puns, knock-knock jokes and so on. Recent controversies about the emphasis of teaching of English grammar, spelling and punctuation and the associated tests suggest that we’re in danger of losing sight of the pleasure in learning about language in primary classrooms. We need to rediscover the joy of gobblefunking.